Chris McNickle argues that New York City Mayor David Dinkins failed to wield the power of the mayor with the skill required to run the city. His Tammany clubhouse heritage and liberal political philosophy made him the wrong man for the time. His deliberate style of decision-making left the government he led lacking in direction. 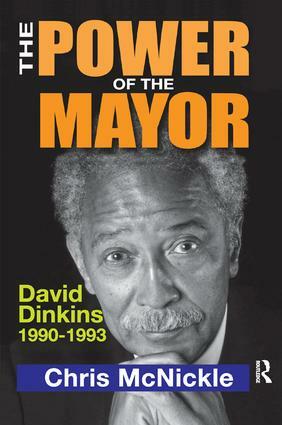 His courtly demeanor and formal personal style alienated him from the people he served while the multi-racial coalition he forged as New York's first African-American mayor weakened over time.Dinkins did have a number of successes. He balanced four budgets and avoided a fiscal takeover by the unelected New York State Financial Control Board. Major crime dropped 14 percent and murders fell by more than 12 percent. Dinkins helped initiate important structural changes to the ungovernable school system he inherited. His administration reconfigured health care for the poor and improved access to medical treatment for impoverished New Yorkers.McNickle argues that David Dinkins has received less credit than he is due for his successes because they were overshadowed by his failure to fulfill his promise to guide the city to racial harmony. This stimulating review of a transitional period in New York City's history offers perspective on what it takes to lead and govern.